Friday 15th March saw the second Youth Strike 4 Climate with thousands of children missing school in a rally to force action on climate change policy. The Youth Strike in Oxford was held in Bonn Square and is part of the wider #FridaysForFuture movement, initiated by 16-year-old Swedish activist Greta Thunberg, now nominated for the Nobel Peace Prize, to protest climate inaction. Protests were happening in more than 60 places in the UK, including Birmingham, Guilford, Manchester, Brighton. On the international level, more than 100 countries were involved, including India, US, South Korea and Australia. Students were protesting under slogans such as ‘There is no Planet B’, ‘Denial is not a policy’ and ‘If you don’t act like adults, we will’. The strikes in the UK are organized by a coalition of students from Youth Strike 4 Climate, the UK Student Climate Network and the UK Youth Climate Coalition. The coalition demands a declaration of climate emergency by the government, a change in the school curriculum to include climate change and a greater focus on educated the British public about global warming. This sense of urgency comes in the wake of the new IPCC report, published last October, which warned that humanity has 12 years to take emergency action in order to prevent global warming greater than 1.5°C, beyond which even half a degree will significantly increase the risks of drought, floods, extreme heat and poverty across the globe. 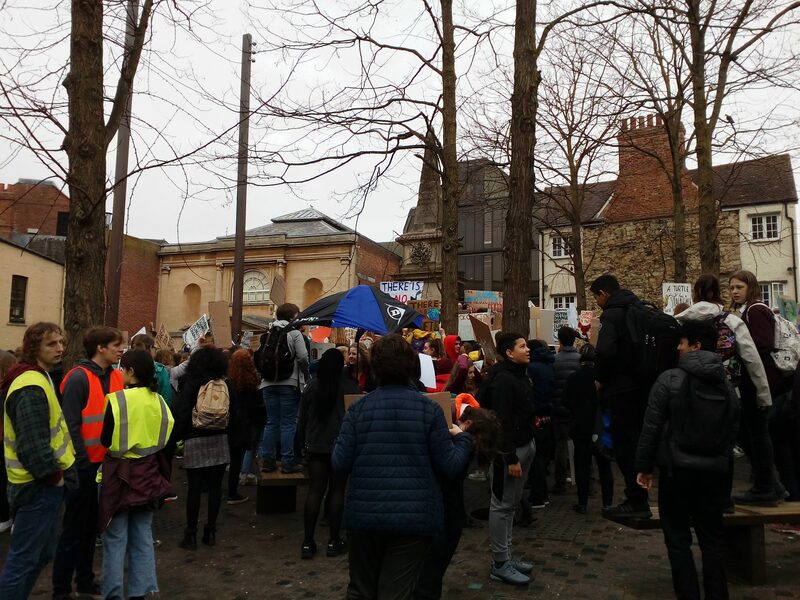 During the demonstration in Oxford, students marched around the city centre, listened to a number of speakers, including representatives from Oxford Young Greens, SESI Refill and Oxford’s chapter of Extinction Rebellion and were given an opportunity to speak themselves. The mood was that of a lively rebellion, with clear anti-establishment sentiments. A number of student speakers expressed the sentiment that the government “doesn’t care” with one asserting “if there is no earth the money doesn’t matter”.